Joy William says: "It was only me that is alive now"
Hello, I am Miss Young. I received this story from a friend. Let me call him Steven. Go to the homepage to see more stories. I have been in contact with a scammer. It is the same story as Faith Abidi. Only now it's Joy Williams. The bank is Rabo Bank of London. The Rev. is Rev. Ken Kagama. The attorney is Dickson Ali. If you have someone that can catch them, I have where they might be at. Address is: #18 Lamine Gueye, Dakar, Senegal. The amount was $9,700,000 in her account. I have phone numbers. The Rev. is: +221-538-37-23. Dickson Ali is:+221-538-19-23. The attorney is on the second floor. All this info is in the emails I received from them. If I can be of further assistance email me. My name is Joy William from Ivory Coast in West Africa,5.3ft tall, dark in complexion,(never married before )and presently i am residing in the refugee camp here in Dakar as a result of the civil war that was fought in my country.My late father Dr Ngumbe William was the managing director of Fredcocoa and Associates (Ltd) and he was the personal advicer to the former head of state (Late Dr Robert Guei) before the rebels attacked our house one early morning and killed my mother and my father in cold blood.It was only me that is alive now and I managed to make my way to a near by country Senegal where i am leaving now. Attached here is my picture and I will send another picture in my next mail.I will also like to see your picture. Sequel to your email on how to prepare a power of attorney for you and your partner Miss Joy William . 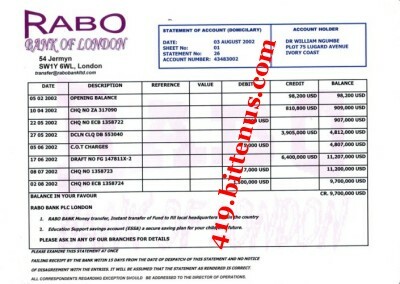 Your partner Miss Joy was in my office with Rev Ken Kamaga to discuss about the issuing to you an authorisation letter that will enable you stand on her behalf to transfer her money from RABO BANK OF LONDON to your account in your country or elsewhere. Prior to my enquries from the bank and high court,I understand from the bank that there are three documents required by them before the transfer of the money to you. 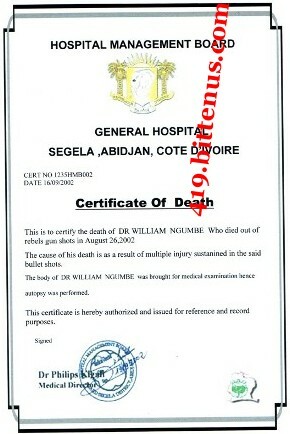 2.A copy of His Statement of account. (WHICH I HAVE ATTACHED TO THIS MAIL). It is now remaining one document. Which is power of attorney which will enable the Bank to deal with you on behalf of your partner. system. (which is the fastest way of sending money to enable my noble office prepare and validate the power of attorney here in the high court and notary republic respectively. Send or call me for the information as soon as you send the money to enable my chambers collect the money from western union local office here. Steven did not send the money, and he stopped all further contact with these scammers. Maybe they will contact him again, using a new name. 10 days later, I receive this letter with the same picture. Now she is called Solange Toure! Keep away from these scammers.